How Does He Help You: Trevor guarantees your satisfaction. If there is ever a problem, Trevor will make it right. In 1998, after being honorably discharged from the U.S. Army, I spent my first summer working with my brother, Ty. That year I power washed, painted and stained decks while I got re-acclimated to civilian life. I remained in the New Jersey National Guard for the next seven years while I earned my B.A. from Rutgers and my M.A. from Rider University. Over the years I would often return to work with Ty over my summer breaks to help him with the company. Then I decided to join the family business full-time. It has been one of the best decisions I have ever made. And it has been a non-stop adventure ever since. As soon as one project ends we are always starting a new one. The team of people we have built at Monk’s are a joy to work with and feel like an extended family. All of the people here are always ready and willing to lend a hand or advice on any project we are working on. 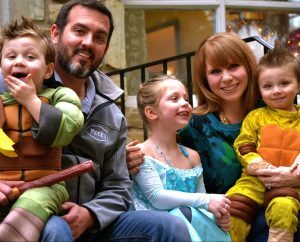 Trevor Monk lives in Basking Ridge with his wife, Caryn, and their four children. He is in the field every day and always available to come to your job site. Trevor manages and trains the Estimators and is responsible for customer satisfaction. If you have any questions, concerns or suggestions, please email Trevor Monk at [email protected] Or, if you would like to talk to Trevor Monk, please call the office at 973-635-7900. Estimate appointments are Tuesday – Saturday. So, make an appointment with a Designer in our Showroom. While you are welcome to pop in, an appointment guarantees you undivided attention for an hour and a half. You can shop for Cabinetry, Countertops, Tile, Flooring, Hardware, Vanities, Windows & Doors.